Meet Pearl. She's another rescue I brought home a few months ago. Other than a few bruises and scratches, she was in fairly good shape. All she needed was a little TLC. diabolical (hubby's words, not mine) deer head. She was a fabulous find a few months ago on Craigslist. I loved her quaint feet and charming beaded details like this. a negotiation I'm rather proud of. It may be a sign that the my Craigslist curse is over! What's this curse I speak of? Me: "Hi, I'm really interested in the Nigerian dwarf goat herd you have listed for $75! Would you take $70 for them?" Seller: "Great! Sure, we'll take $70." Me: "Terrific! When can we come pick them up?" Me: "Hi! Just in case you missed my last message. I'm sill interested in the dwarf goats and would love to take them off your hands tonight!" 24 hours later.....still more silence. I'm not kidding people, it happens EVERY.SINGLE. TIME. As if that's not baffling enough ( yeah, I see you there scratching your head, thinking "Gee, Jen, this is really baffling! ), for every single time I've been blatantly ignored while trying to close a deal on the CL, I just end up bribing my hubby to impersonate a new a buyer and to contact them, and doggone it not only do they promptly respond to his inquiry, he talks them down in price even farther! Obvi, I'm all "Muahaha....jokes on you, suckers!" BUT seriously, what gives? Okay, okay I digress. How rude of me, back to Pearl. I knew right away I wanted Pearl's new home to be in our front entry way. I also knew that I've been binging on greys and neutrals lately, and that I needed to add some color to her. Soooooo.....say "hellooooooooo"to the new and improved Pearl. The color is called Eucalyptus and it's from Martha Stewart's Vintage Decor chalk paint line. So far I've only seen it at Michaels or on Amazon. This was actually the first time I used chalk paint for a project. Chalk paint, not to be confused with chalkboard paint, is a favorite among furniture rehabbers/bloggers/wannabe ballers/shot callers. Did I really think it was all it's cracked up to be? I plan on posting about my thoughts on it soon. In the mean time, if anyone else has used it I'd love to know what you think about it?! As every girl knows, accessories can really take things up a notch. Pearl got some new bling thanks to these pretty vintage-inspired glass knobs I found at Hobby Lobby. Someone else really liked them too. We're actually planning on planking some of the walls in here. If I had it my way, this whole house would be planked. Seriously, I'm obsessed. I blame Chip and JoJo. This entry way has a little ways to go, but at least I don't fear the doorbell now! "Hello, Mr. wanna- sell-me-a new-alarm guy, I see you checking out my drawers". For crying out loud, I mean the dresser drawers people. Get your mind out of the gutter! **This post contains affiliate links, which means if you decide to make a purchase through my link, I will receive a small commission for it. This doesn’t cost you anything additional. This in no way affects my opinion on these products. Thanks for supporting this blog (and sometimes my cheap wine habits). It turned out amazing. So glad CL worked out this time. A planked wall would look perfect there. Your CL experiences are just like mine-- so frustrating! Love Pearl's color, how could you go with anything else? I name my makeovers too! 😂 So glad to find kindred hearts! Haha! Your writing style is genius! Thanks for sharing. Love your makeover!! great color and hardware! Pearl turned out beautiful! My question: where did you get that great flamingo print?! A few of you asked about the flamingo print and unfortunately I can't respond directly back to you because your emails aren't registered! If you happen to swing back through the print is from Hobby Lobby! So glad I saw this! I have been looking for a perfect mix of mint green / aqua / turquoise chalk paint for a project I pulled out of my neighbor's trash. 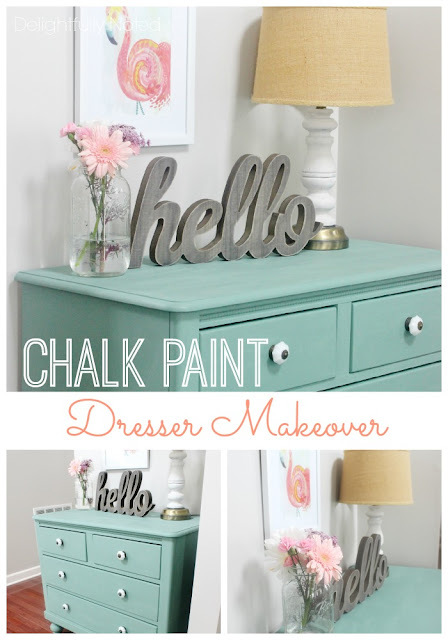 I'm looking forward to hearing your thoughts on using chalk paint. I have never used it. Great job! I got the same "hello" sign for my entry and painted IT that wonderful Aqua color. Love your dresser makeover! i absolutely love your post and your writing! i would love to do my daughters dresser and was wondering how much of the paint you needed to adequately cover the dresser. Our dresser is about the same size but its dark brown so i might need to prime it . I have the exact same dresser! Haven't painted it yet. Plan to use in entry also! Hubby was working doing some reno work at a hotel- they were changing out furniture and they gave him a couple dressers!!! Score! I've chalk painted one bright yellow with mercury glass handles fm Hobby Lobby - using as a "bar cabinet"! You've inspired me to get busy on the next. Great color.